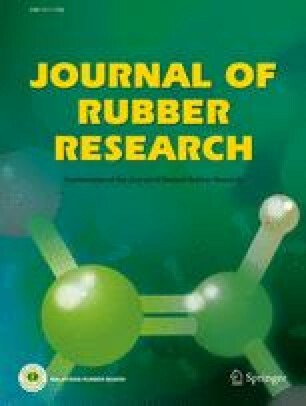 The aim of this study was to examine the influence of hybrid fillers based on activated carbon/nanoscale magnetite synthesised in situ on the curing, mechanical and dynamic characteristics, electrical and thermal conductivities, dielectric characteristics and homogeneity of natural rubber based composites. The fillers have been characterised by X-ray diffraction and X-ray photoelectron spectroscopy establishing the influence of the magnetite layer on the texture characteristics. It has been found that magnetite amount changes the texture characteristics of activated carbon. The increasing amount of deposited magnetite hinders the vulcanisation process and loosens the vulcanisation network. The elongation at break and residual elongation increase, while Shore A hardness and the modulus 100 decrease. The storage modulus decreases, while the mechanical loss angle tangent increases together with the dielectric constant and the dielectric loss angle tangent also get higher. The thermal conductivity coefficient and homogeneity increase at higher magnetite amounts.